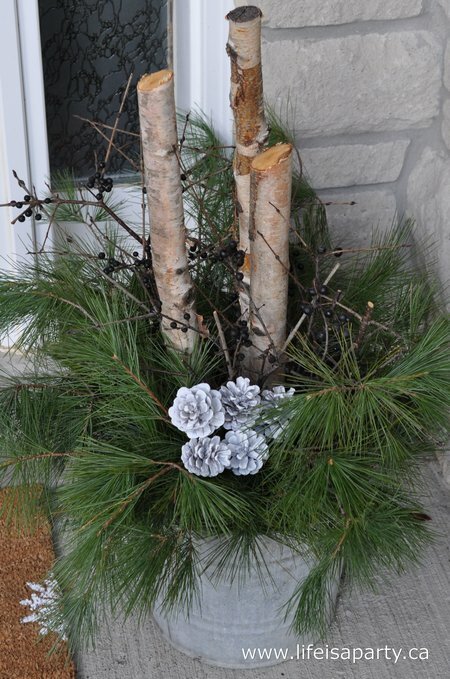 I loved my fall outdoor linear planter so much that I decided to do another version of it for Christmas. It came out great, and I love that it’s something a little different from the standard Christmas urn with greens, bobbles and ribbon. My love of white continues with the Christmas decor, and I really love how the white pops against all the Christmas greens. 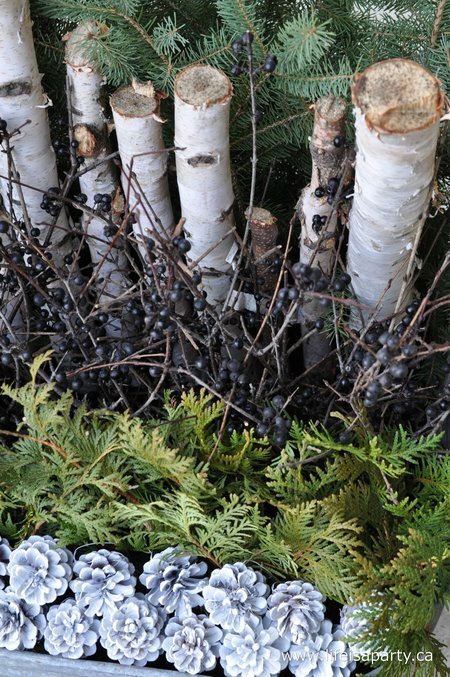 To make this outdoor Christmas arrangement, I started with the fall planter, and removed everything but the birch poles. 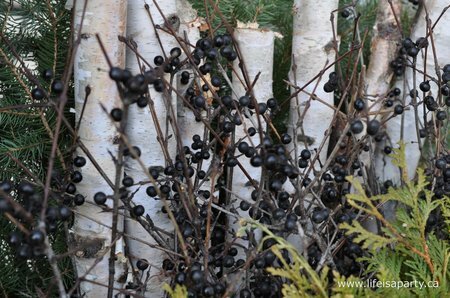 After the birch I added a row of these black berries, European buckthorn -according to my google research. 😉 They have thorns so be careful, (she said from experience). After that I added a row of cedar, just common Ontario cedar, not the fancy B.C. kind. Sometimes Ontario cedar is more yellow, but I thought this looked pretty good, and the contrast is also good for this linear arrangement. My final row is some spray painted pine cones. I liked the way it related to the pine cone wreath I made here. I have to admit that I fiddled with this arrangement and may or may not have even sent some pics to my florist sister for some advice. In the end the key was trying to make the lines as full as possible. 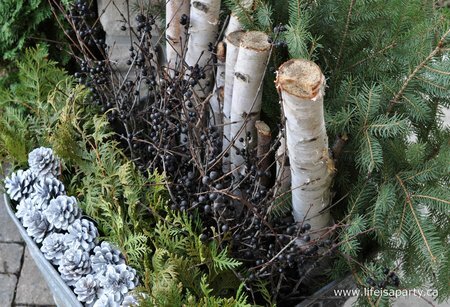 Some other suggestions for rows if you’re considering making a linear arrangement like this are moss, the really large pine cones, other coloured berries, painted twigs, large cinnamon sticks like I used in my fall version, and of course other Christmas greens -magnolia leaves would look great. Of course I also needed a new doormat, and yet again the perfect one I had pictured in my mind didn’t seem to exist in real life, ever have that problem? So, what’s a DIY-ier to do but make it herself. This project started with a plain coir mat. 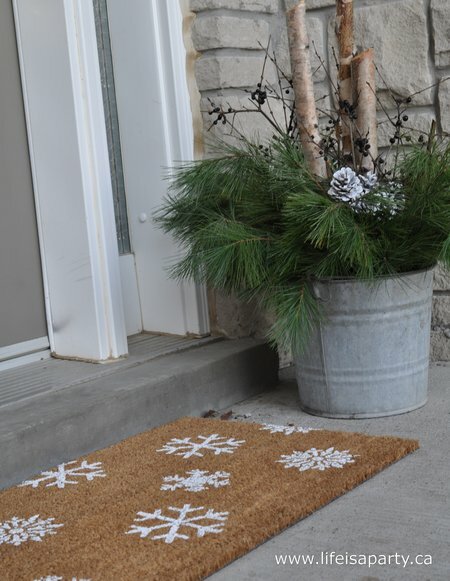 I used the same method I used here to stencil the fall leaf doormat. 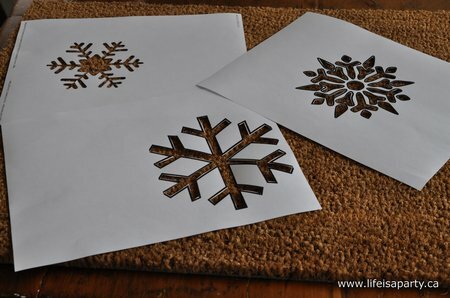 The snowflake images were found on the web. First I printed them out, and cut out the middle with an exacto knife to create a stencil. Then I used craft paint to create a random pattern. I really like how it turned out, and it should work all through the winter, not just for Christmas, which is always good. 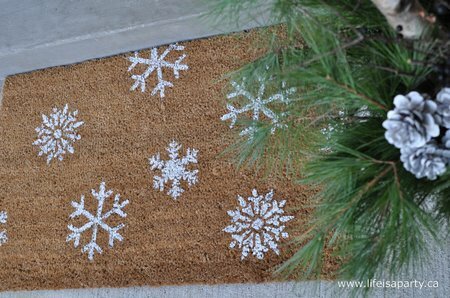 It helped tie together the white of the planters, and the wreath, with the snowflake Christmas lights we have along the roof. I added one final outdoor Christmas arrangement right beside the door. 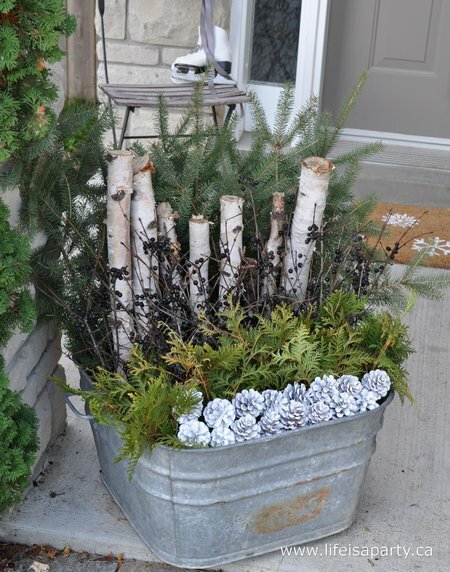 Again I used an old galvanized pail, to match the large square one. This arrangement was really simple. The three shortish birch poles, some more buckthorn berries, some pine cuttings, and more white pinecones help tie this arrangement to the other one. I really liked how it used the pretty much the same materials, but in a really different way from the linear arrangement. 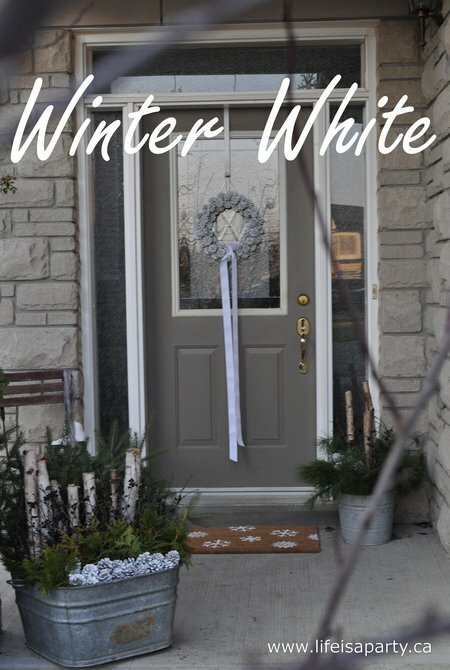 With pretty white outdoor Christmas decor, life really is a party. So pretty! I haven’t started our decorations yet, you’re so on the ball! That planter is so gorgeous, your porch looks really pretty. Very pretty and a unique style! Amazing! I have one of those washbins and now I know what to do with it! I’m a big copycat cause I have zero creativity skills..but I am good at copycatting!!! Thank you so much just plain adore this! 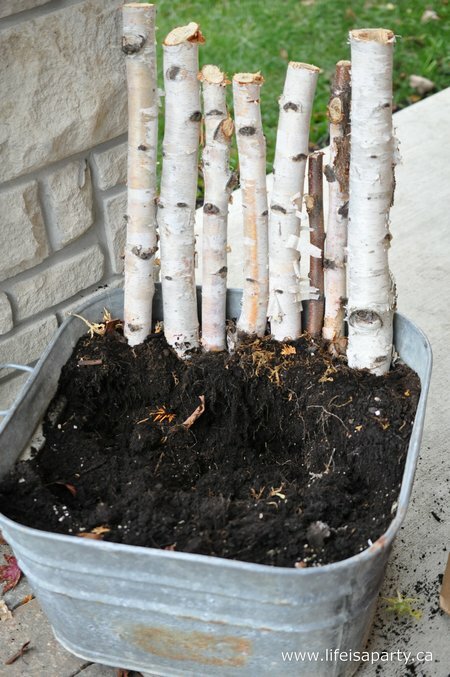 Hi Tracie, I saw birch tree poles at Walmart this year. Candles would be lovely too. Your front porch looks lovely. 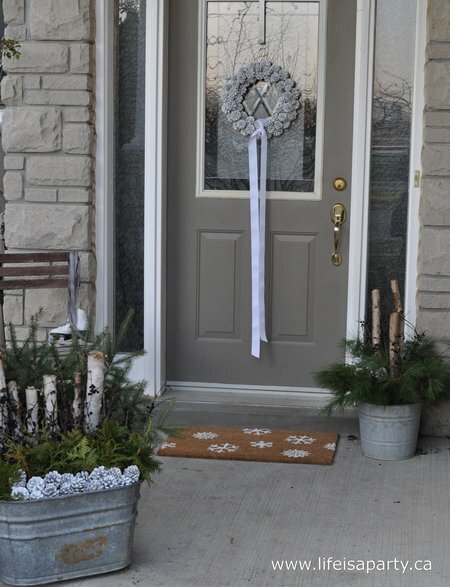 Love the birch poles and that door mat really is the perfect finishing touch. As petty as it all is.. can you tell me what color you picked for the door. I love that shade of Gray! Have any idea what it might be? Sorry Melissa, I’m not sure what colour it is. It was chosen by the the builder. Glad you like it. I live in Ontario, Canada, so it says green here for months after it’s cut if it’s outside in the cold. If it’s warm where you are, it might be like bringing it inside. It will start to dry out, but should last maybe a month?